You probably already know that FamZoo can automatically split regularly scheduled allowance payments between your child’s virtual bank accounts. But, what if you don’t do allowances in your family? What if your system involves paying for chores or odd jobs instead of — or in addition to — paying out allowances? Well, you may also know that you can create online chore charts in FamZoo. You can even attach multiple reward and penalty amounts to each chore item and funnel those amounts into distinct accounts. Cool. But, what if you’d like to split a single chore amount percentage-wise between multiple accounts — just like you can do for an allowance? 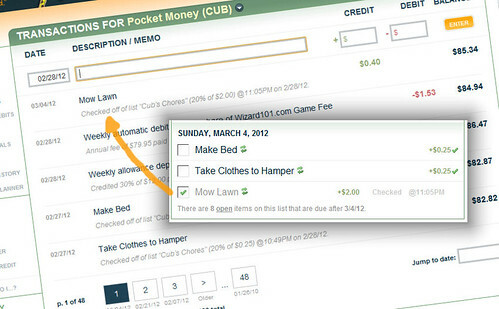 First, you need to tell FamZoo how you’d like to split payments between accounts. Typically, parents split payments between spending, saving, and giving accounts, but you can set up any number of accounts for your child — maybe you’d like to add a “family tax account” so your kids can help save for that dream vacation to Disneyland. Are you already paying your child an allowance with FamZoo? Would you like to use those same split percentages for your chore payments? If so, you’ve already got what you need for step 1, and you can move on to step 2. Otherwise, you need to define your desired split percentages by creating a new allowance. (If you don’t do allowances in your family, don’t freak out here! I’ll explain in the next paragraph.) Find a Create Allowance link. There’s one at the bottom of the Allowances section on the Overview tab, and there’s another one in the left hand sidebar of the Allowances page on the Bank tab. Click the link, and fill out the form. For those of you who don’t do allowances: consider this a “fake allowance”, name it something like “Chore Payments”, and set the amount of the allowance to $0. That will prevent FamZoo from making any automatic payments, while letting you use the rest of the allowance definition to dictate how chore or odd-job payments should be split percentage-wise between accounts when checked off. Note: this “zero allowance template” trick can be used for ad hoc split credits as well — like, say, when your child gets paid $10 for feeding the cat while the neighbors are away. When you’re setting up the reward portion of an item on your chore chart, just pick an allowance from the pull-down list instead of a specific account. 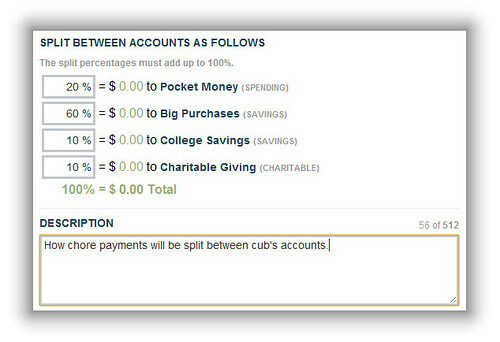 This tells FamZoo to split the amount using the accounts and percentages defined in the selected allowance definition. 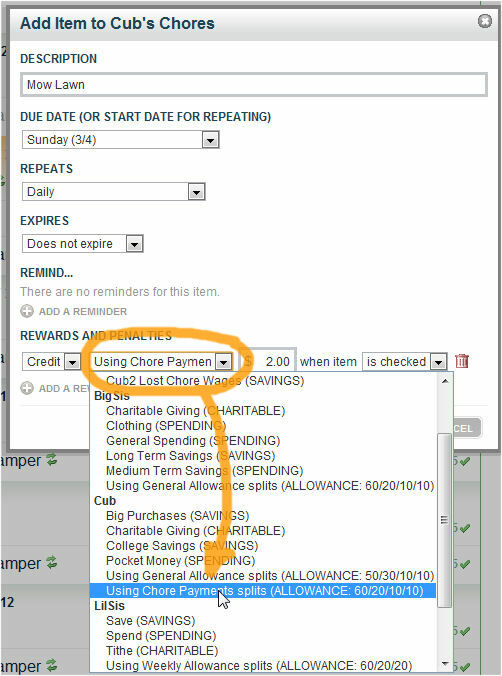 When you check a chore off the list, multiple payments are made as defined by the split. You can verify this by visiting the transactions page for each account. The memo field identifies the chore list and explains the simple math used to determine the split transaction amount for this account. Cool bonus tip: Did you know that if you un-check a chore, its associated payment transactions are automatically removed? So, if you make a mistake or you decide a checked-off chore was not quite up to snuff (despite your youngster’s objections to the contrary), no worries. You can easily undo everything with one click. Got a question or a comment about how our online chore charts work? Don’t hesitate to contact us on our site or leave a comment below. Where did you find that? Is it a website? Or a downloadable thing? Please answer my questions, for it looks very handy! It has an associated mobile app.